Russian Translation Pros is a professional translation agency providing translation and interpretation services to businesses and individuals in Novgorod, Russia. We work in technology, medical/pharmaceutical, legal, entertainment, and other sectors. We have local, experienced native Russian English linguists to help you with fast and professional services. Our focus on affordability leads to our goal of exceeding customer expectations. Novgorod or Velikiy Novgorod is the most ancient and important historic city of North-Western Russia. This city is very important to the History of Russia. It is situated between Moscow and St. Petersburg. Novgorod the Great is the Russian English Translation of Novgorod Velikiy name. Novgorod can be translated or interpreted as a new city. Novgorod is only 180 km or 111 miles far from Saint Petersburg. This makes this historic town a pretty expensive place to live. The Novgorod City lies on the Volkhov River and near Lake Ilmen. Its population is about 217 000. 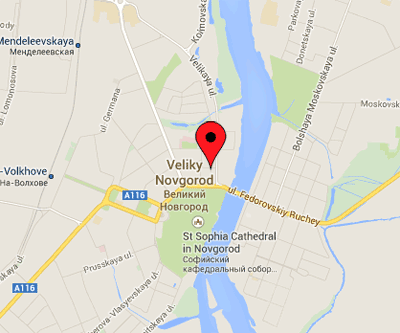 Novgorod Veliky is the administrative center of Novgorod Oblast'. Novgorod was founded in 859 and in 2009 it will celebrate its 1150th birthday. There are hundreds of ancient churches in Novgorod. And they are open to the public and they are active churches. The most famous tourist cite of Novgorod is Novgorod Kremlin. It is a pretty small, but very interesting and nice Russian town for tourists. We offer Russian translation services, hotel reservations in Novgorod. We work for individuals and small groups interested to visit Novgorod, St. Petersburg, Novgorod, and other great places in Russia. Every customer request is unique for us. We will try to find what you are looking for and what best suits your budget. If you have question about your travel reservations, please contact us. We can help you find appartments in Moscow, St.Petersburg, and Novgorod Velikiy. Personal Tours are also available. Have questions? Need an estimate? Weэre here to help. Just send us a message or call. We will get back to you as soon as possible - that's a promise!